One of the most dramatic changes wrought by the recession is wide range in size of the jobs facing cabinet shops. Where once upon a time a shop set up for large projects could sneer at little jobs and let them go, today’s shop needs to be able to profitably handle any job of any size or it will lose out on work. 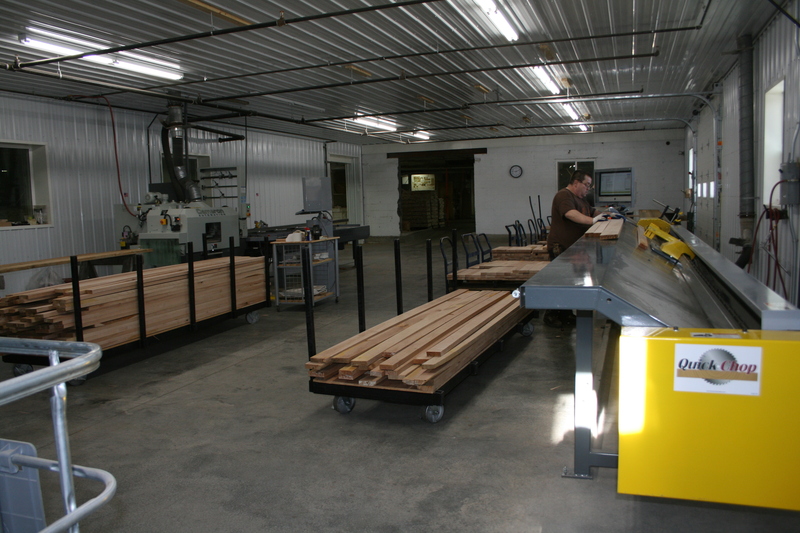 That was the case at Unique Woodworking in Weymouth, Mass., which specializes in melamine cabinets for mostly commercial and institutional customers. Owner Gary Medeiros realized he needed to set up his shop for maximum versatility and efficiency regardless of the size of the job. And while most of the jobs now may be smaller, he also knows he needs to be ready and not lose traction for when the economy improves and jobs start growing. His solution was to set up three separate manufacturing cells that can work independently or in conjunction with each other. 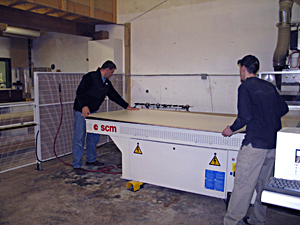 Before the shop was automated with CNC equipment, all parts were cut on a Striebig vertical panel saw. One time they cut 600 parts in an eight-hour shift on the saw. Medeiros swears by the machine and still uses it regularly, but today he sees it best for manufacturing smaller projects, such as those requiring fewer than 10 boxes. “We get better yield on small jobs with the Striebig,” he says. When the job requires more than 10 boxes but less than 50, Medeiros turns to his SCM Practix CNC router. The unit has a sweep system so it slides a completed sheet of parts to an outfeed table, allowing the machine to be reloaded and start cutting immediately. Then, while it is cutting the next sheet, a worker can be unloading the parts and sending them onto the Gannomat Index 130 Trend dowel machine for boring and the Holz-Her 1317 edgebander for banding. For the really big jobs requiring more than 50 boxes, Medeiros has an SCM Sigma Impact beam saw and an SCM Tech 90 Super point-to-point CNC machining center. Like most shops in this economy, Medeiros has downsized a bit. He had 16 workers in the shop and six in the office last October. Now he’s down to just two in the shop and four in the office. But the CNC automation and his versatile shop setup have let him handle the changes and consider more. “This is a time to relook at the business and re-evaluate the whole business,” he says. He is sold on the value of CNC manufacturing and wishes he had done it 10 years ago. He is convinced that efficiency and top customer service will allow him to compete and weather the current economic storm despite strong price competition. He describes some recent bidding experiences in which not only were there frightening low bids but also bidders from much farther distances, such as Kentucky or Louisiana, to bid on a Massachusetts project. Price is becoming more of an issue, but Medeiros is confident that he can compete on more than that. Since his business is so price competitive – in one reason bidding his number was fifth out of 18 bids – Medeiros knows he needs to keep a close eye on his costs and processes. So, besides having right-sized options for manufacturing, he’s constantly checking his labor efficiencies. He uses simple time cards but with specific divisions for projects and processes. For example, he might require workers to log their edgebanding time on a project separate from other operations. All of this goes into his regular QuickBooks accounting program, so he has ready access to detailed costing on every job. When he has a new job to estimate, he goes over the numbers for similar jobs before he submits his bid. But his checks don’t end there. After the bidding ends, whether he wins or loses, he always calls back to find out what the numbers were, and who the other bidders were. In some cases, he’s learned not to waste his time bidding against certain companies known for dramatically lower bids. He’s not going to bid lower than he knows it will cost him just to get a job. “I look at every job we need to make money,” he says. Medeiros is a firm believer in specializing in what he can do best and most efficiently. 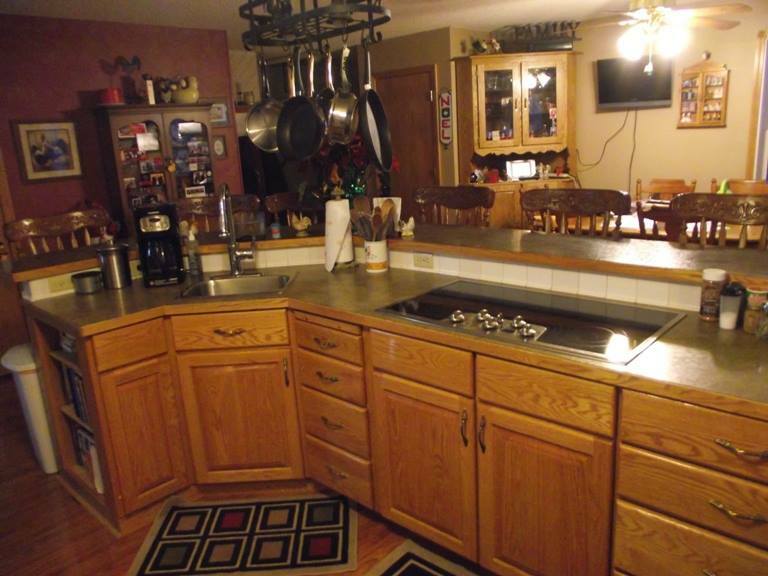 He subs out solid surface countertops and most solid wood work. He outsources raised panel doors. He doesn’t own a delivery truck, and he has two installation outfits he relies on, one union and one non-union, depending on the project. He’s confident he’ll bring his company through the current downturn and won’t have to waste any time ramping up when the recovery comes.